Today's foggy start reminded me of the sea smoke that enveloped Marblehead Harbor a few months ago. On December 29th, I headed down to Front Street and captured images of sea smoke in truly arctic conditions. After exploring the lighthouse and capturing images of the Eastern and Corinthian, I turned my camera towards Childrens Island to find it surrounded by smoke. This image of a lobster boat heading into the smoke of an arctic morning seemed a perfect way to end the week. I had gone out on December 29th to capture sea smoke in the coldest conditions I had ever experienced. Before I had a chance to set up the tripod, I spotted this lobster boat making its way out of the harbor. I quickly composed this shot seconds before the boat disappeared into the sea smoke. Last Valentine's Day was the coldest of the entire Winter and resulted in incredible sea smoke conditions within Marblehead Harbor. 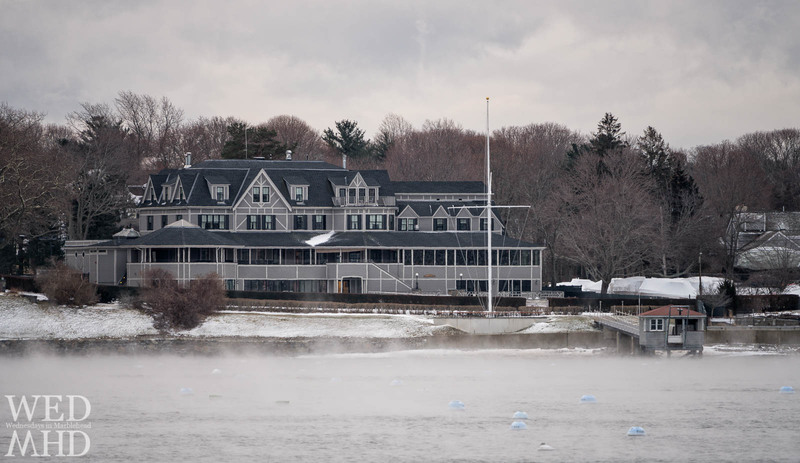 I captured numerous scenes that morning and ended up at the Corinthian just before 8am where I found rime ice had formed over the rocks near the base of the yacht club. I composed this image to include the rime ice in the foreground, sea smoke over the water (which had turned into confluent fog at that point) and Abbot Hall in the distance. Thankfully, this Valentine's Day was much warmer than the one in 2016. I don't think I've ever had a situation like this one where one of the last images captured in December immediately cements a place in the Top 10 list. I had another image of sea smoke in this #7 spot but the combination of sea smoke, a sun star (formed by the break in clouds partially obscuring the morning sun) and that red glow behind Marblehead Light made this one an instant favorite. #7 on the Top 10 of 2016 is this image of smoke on the water and fire in the sky captured on December 16. As we near the end of the year, I wanted to share my top 10 images of 2016 leading up to the annual New Years Day slideshow recapping every image shared on Wednesdays in Marblehead (253 images this year). This image of tendrils of sea smoke was taken on Valentine's Day and was the most impressive display of sea smoke I had even witnessed. The angle of the morning sun added much needed backlight to the smoke and created an other-worldly display making this an easy favorite for #10 on the Top 10 of 2016 list.